If you know anything about DNS entries, it won’t take you too long to figure out that I live in Fremont, CA. So, it peaked my interest to see a letter to the editor in our hometown newspaper, the Fremont Argus. I THINK The Washington Post article “Kiss your lip balm addiction goodbye” that appeared in The Argus on May 11 is the most irresponsible and deceiving article you have ever printed. The writer probably never has had sun poisoning on her lips or cancer, or just dried, cracked lips. I am 75 years old and I think lip balm is the best thing ever invented, and that it should not be considered an addiction. The connotation of this article was really bad. With a harshly worded letter Â like that I thought I’d look at the article to form my own judgement. Let’s make a list of the important things you need before walking out the door: Wallet: Check. Cellphone: Check. Keys: Check. Lip balm? You slap your back pocket. Nope. Rummage through your bag. Nada. This is a problem. A huge, paralyzing problem. You are a lip balm addict, after all. And you are not alone. Wait a minute. If it isn’t addictive, why are you offering advice to reduce “compulsion?” Â The advice is good, though. Don’t lick your lips - long a hallmark of the advice we have dispensed here. A dermatologist also recommends using subblock on your lips. Sunblock, the ingredient that Pat Finn of Fremont should have been using on Â her lips to prevent cancer, not plain old lip balm. Of course, Finn complained about the premise lip balm addiction but the article says it doesn’t exist. Hmm. Never mind. Finally, think about whether it’s the product or the behavior. Lip balm may not cause a physiological dependence, but as an addictive behavior, it’s no less relevant if it leads you to make lifestyle changes, says Carl Lejuez, director of the Center for Addictions, Personality and Emotion Research at the University of Maryland. So, if you’re arriving late to meetings because you were searching for your ChapStick, you may want to do something about it. Lejuez recommends replacing the lip balm habit with another. Every time you’re compelled to apply lip balm, reach instead for, say, your water bottle. 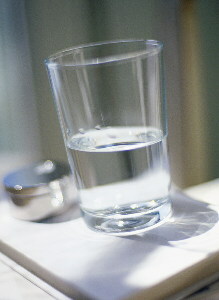 Most of us don’t drink enough water anyway, and the hydration will only help your lips. Well, sounds like Lejuez isn’t exactly denying lip balm addiction. And as a director of a research center about addictions he probably know what he’s talking about. In any case, drinking more water probably isn’t bad advice and if it saves just one person from falling down the path of addiction then why not. Drink up!